The headline for this story is peak 2017. Last Wednesday, a Reddit user named /u/HanAssholeSolo posted a GIF titled "Trump takes down fake news (Colorized, 2017)" to Reddit's largest pro-Trump subreddit, /r/The_Donald. The post gained a few thousand upvotes and, according to Reddit's publicly available metrics, wasn't even in the top 20 of the most popular posts on /r/The_Donald in the last week. Nevertheless, the GIF — or a piece of content that looked a lot like it — ended up in President Trump's official Twitter feed on July 2. Many believed the tweet was a threat against members of the media and CNN employees specifically. Reddit users started freaking out, and quickly set up a celebration post under the header "Congratulations to /u/HanAssholeSolo. 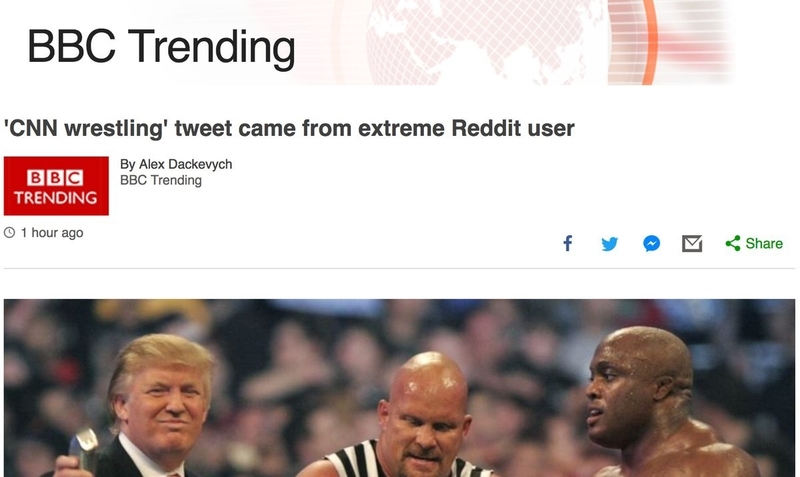 Their dank WWE meme got TWEETED by the PRESIDENT of the United States, creating a shockwave of SJW 'REEEEEEEs' heard all the way from North Korea. You win the unofficial community MVP (most valuable pede) award. Also, now it's confirmed that Trump sees our memes." There have been rumors circulating on Reddit since before the inauguration that members of Trump's inner circle are active on Reddit and feed the president memes and in-jokes for his tweets and speeches. As Reddit was celebrating HanAssholeSolo's victory, one user pointed out that what Trump tweeted wasn't actually HanAssholeSolo's GIF. HanAssholeSolo's GIF has since been taken down, but screenshots remain and there are some key differences. First off, what Trump tweeted was a video and has audio. Specifically, it has audio from this 2007 WrestleMania clip. Also, HanAssholeSolo's original GIF was shorter, had a different aspect ratio, and had a WWE logo in the corner. Here's a screenshot from the video that Trump tweeted. Not even the colors are processed in the same manner. HanAssholeSolo's GIF has an NTSC aspect ratio, because it was cut directly from a taping of analog WrestleMania footage. Trump's video has an aspect ratio of 16:9. There's also the matter of length. In HanAssholeSolo's original GIF, the wrestling match footage plays once and then, because it's a GIF, loops itself. The video version doesn't loop. It has a splice that starts around the 12-second mark, and then the video starts again. HanAssholeSolo's original GIF was uploaded directly to Reddit through native-image hosting — which means once the GIF was uploaded it became an HTML5 video file. Someone downloaded the GIF that HanAssholeSolo originally posted to Reddit. Then that person cropped it to better fit a video player like Facebook or YouTube. Then they went through the effort of syncing it back up with audio from the original clip. Then that person put it somewhere where Trump or one of Trump's people could see it and download it. Then whoever found the video version had to get it to Trump's phone. According to TweetDeck, Trump sent his tweet from an iPhone. Which means that the video made its way into the president's Twitter account through his phone's camera roll. There are only a few ways a video can get into an iPhone's camera roll. Basically, someone sent it to the president via a private messaging app like WhatsApp, iMessage, or just simple texting. Or it was emailed to him and he downloaded the video as an attachment. It would be almost impossible on an iPhone for Trump to have seen the video and downloaded it himself. Once it was in his camera roll, he uploaded it to Twitter via the camera roll as you would with any other video. A similar process would have been required for this tweet the president posted on Tuesday. Once the video was tweeted, news organizations went looking for the source. Most reporters appeared to have screenshot the video and put it through Google reverse image search, which brought up HanAssholeSolo's original. GIF. HanAssholeSolo was a frequent poster in a subreddit called /r/ImGoingToGoToHellForThis. It's a subreddit in which users try to one-up each other with sexist, racist, and generally offensive memes. HanAssholeSolo's user history is no longer accessible, but you can read an archive of what he wrote here. The problem is that there is a still unknown third party here who is just as important, if not more important, to this story. Regarding the question of what Trump or his team views online, the fact this video is based on a GIF from Reddit only means that whoever made the video version reads /r/The_Donald. Whoever forwarded the video almost certainly didn't get it off of Reddit. The video most likely came from a far-right Facebook page that routinely scrapes /r/The_Donald and 4chan for memes. This distinction between GIF and video becomes even more important in light of CNN's interview with HanAssholeSolo on Wednesday. The article was written by reporter Andrew Kaczynski, formerly of BuzzFeed News. After CNN tracked him down, HanAssholeSolo posted a lengthy apology about the whole incident and deleted his account. "Trolling is nothing more than bullying a wide audience. Don't feed your own self-worth based upon inflicting suffering upon others online just because you are behind a keyboard," HanAssholeSolo wrote. He also told CNN that no one from the White House asked his permission to use the GIF. Well, that's because they didn't use his GIF. They used a video that had been remixed from it that they found from a third-party user on some completely different social network. Which members of the far right, as well as Donald Trump Jr., interpreted as a threat to eventually reveal HanAssholeSolo's identity if he ever decides to post racist memes again. 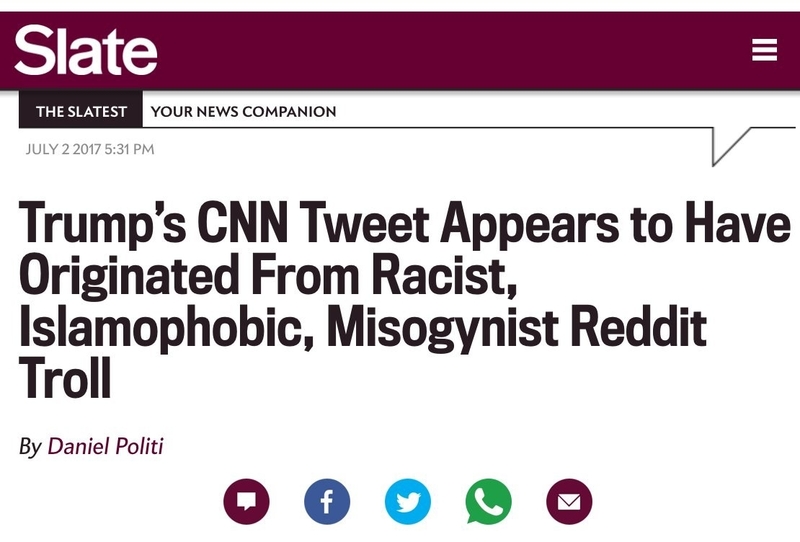 They started a hashtag called #CNNBlackmail which started trending early Wednesday morning. There's also now an entire subreddit called /r/CNNmemes, which is full of even more threatening memes against CNN. It also inspired dozens of threads on 4chan, many of which include threats to hack or doxx CNN employees. As for the perceived threat of revealing HanAssholeSolo's identity, Kaczynski has tweeted clarifications in the aftermath of the #CNNBlackmail hashtag. But throughout all of this, we haven't actually learned anything about where Trump and members of his inner circle are getting their memes.